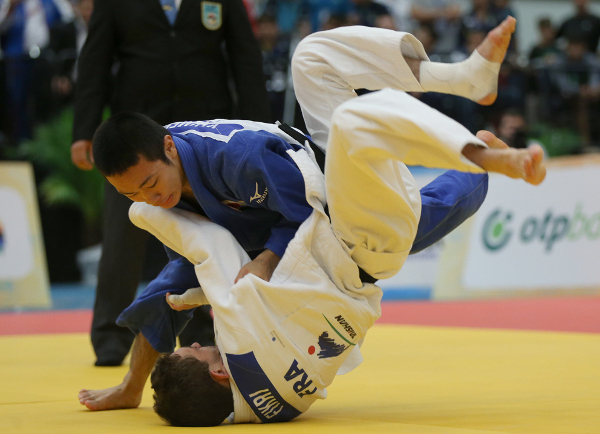 The Junior World Championships, Fort Lauderdale 2014, made a compelling start as the brightest judoka in the sport became the centre of the judo on the opening day of the Championships at the Broward County Convention Center on Wednesday. Four world champions were crowned as the junior men’s -55kg and -60kg categories saw action along with the junior women’s -44kg and -48kg categories. A colossal 521 judoka are competing over the course of the five-day event in Fort Lauderdale with full teams of 20 judoka (10 junior men, 10 junior women) entered by hosts USA, Russia and Japan. Mr. Lance NADING, USA Judo President, said: “I would like to welcome you all to America. We have 72 nations taking part in this Judo World Championships which is the single most prestigious event in this country since the 1967 World Championships in Salt Lake City, Utah. I want to thank from the bottom of my heart, the athletes who trained here so diligently and will go to the the next Olympics in 2016 and 2022 and many of you will capture medals. Japan lead the medal table after day one after winning three of the four gold medals up for grabs on the opening day as Spain broke through to win the remaining gold medal. Mongolia are third in the medal table after earning one silver medal and two bronze medals. Day two will feature the junior men’s -66kg and -73kg categories while the junior women from the -52kg and 57kg categories will have their tilt at world glory. Junior Asian Championships winner SAKAGUCHI Hitomi (JPN) made a winning start for Japan as she won the first final of the Junior World Championships in Florida. The 20-year-old defeated Pan American Championships winner Larissa FARIAS (BRA) to win the first world title of her career. FARIAS was penalised for passivity and that was all the encouragement SAKAGUCHI needed to make a flurry of attacks which ended with a yuko score from a morote-seoi-nage. The Japanese dynamo showed her ne-waza prowess with a series of turnovers before engineering the opportunity to hold her rival down with a kuzure-yoko-shiho-gatae for 20 seconds and ippon. In the first semi-final SAKAGUCHI downed Youth Olympic Games winner and Junior European silver medallist Melisa CAKMAKLI (TUR). SAKAGUCHI won on the ground as she subdued 16-year-old CAKMAKLI with osaekomi-waza for 20 seconds which came after both judoka were penalised for passivity. In the second semi-final FARIAS defeated reigning Junior world bronze medallist Olfa SAOUDI (TUN) and was crying as she came off the mat. The jubilant Brazilian won by tate-shiho-gatame and glanced to the clock before breaking down in tears. 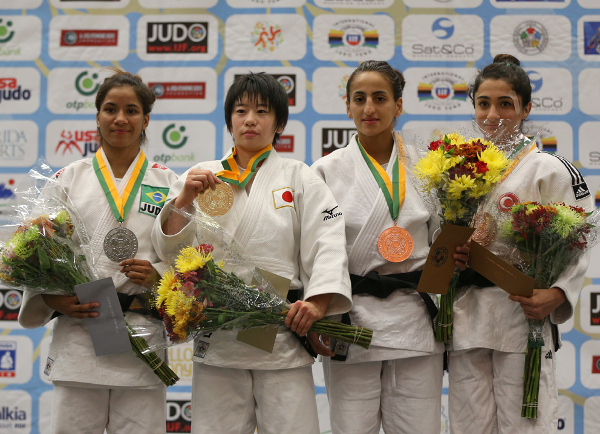 The first bronze medal was won by Junior African Championships winner SAOUDI who bested Catarina COSTA (POR). The contest was scoreless after two minutes but the momentum shifted to the Tunisian after she countered a ko-soto-gake attack for waza-ari which was decisive after four minutes. The second bronze medal was awarded to 16-year-old hotshot CAKMAKLI who showed her fortitude by coming back from a semi-final defeat to humble Junior Asian Championships silver medallist GANBAATAR Narantsetseg (MGL). GANBAATAR went a waza-ari up but CAKMAKLI was unfazed as she responded by scoring ippon after 80 seconds to secure a superb result. World champion KONDO Ami (JPN) returned to junior action on Wednesday and was a class apart as she ruled the -48kg category with plenty still in reserve. KONDO won the cadet world title in 2011, the senior world title in August of this year and has now completed the list with the junior title. KONDO defeated Junior European champion and Baku Grand Slam bronze medallist Dilara LOKMANHEKIM (TUR) in the -48kg final. The Japanese ace initiated an attack with a sumi-gaeshi movement before extending her other leg to lift her Turkish opponent into the air for ippon after 82 seconds. In the first semi-final LOKMANHEKIM defeated Wroclaw Junior European Cup bronze medallist Patrycia SZEKELY (GER) who finished fifth at the Cadet World Championships in Miami last year. The difference after four minutes was a single shido given to the German in the scoreless contest. In the second semi-final former Junior European Championships bronze medallist Cristina BUDESCU (MDA) was well beaten by world champion KONDO who put on a scoring clinic. The senior world number three went ahead with a yuko after 36 seconds from ashi-waza and added a waza-ari and two further yuko scores before putting the Moldovan away. KONDO trapped BUDESCU with a kami-shiho-gatame hold for 15 seconds to win by wazari-awasette-ippon. The first bronze medal was won by Junior European silver medallist Alexandra POP (ROU) who defeated losing semi-finalist BUDESCU by a waza-ari in golden score after a scoreless four minutes of regular time. 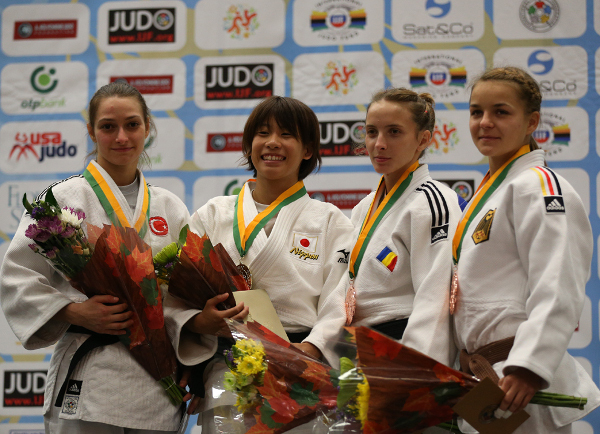 The second bronze medal was won by 17-year-old Patrycia SZEKELY (GER) who bested Serbian u23 Chapionships winner Milica NIKOLIC (SRB). NIKOLIC was disqualified with a direct hansoku-make for diving to send the German judoka onto the medal podium. Junior All Japan Championships winner UMEKITA Wataru (JPN) who finished fifth at the Cadet World Championships a year ago lit up the lightest category in the junior men’s ranks to continue his country’s prominence on day one. In the -55kg final UMEKITA defeated Junior European Championships bronze medallist Kamal FIKRI (FRA) with a huge ippon which had the crowd purring in satisfaction. In the first semi-final FIKRI was able to progress on a single shido score which was given against former Cadet Asian Championships winner Kemran NURILLAYEV (UZB) to settle an otherwise even match where both judoka went all out. In the second semi-final UMEKITA saw off Prague Junior European cup bronze medallist Vahagn HOVSEPYAN (ARM). The Japanese starlet took the lead with a yuko and added a waza-ari from an uchi-mata before adding one more yuko as the Armenian was unable to reply. The first bronze medal was won by 2013 Cadet World Championships bronze medallist BAYARAA Amartuvshin (MGL) who defeated HOVSEPYAN. The Mongolian won with three yuko scores to his name while the Armenian was unable to show his quality which was evident in the early rounds and failed to score in the bronze medal contest. 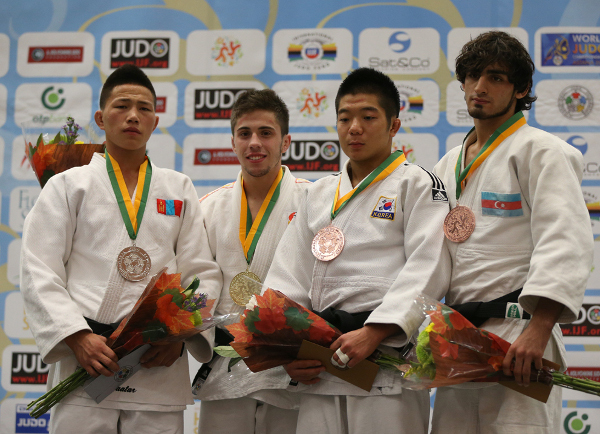 The second bronze medal was also clinched by a Mongolian as Taipei Asian Open winner GANBAATAR Battulga (MGL) bested former Cadet Asian Championships gold medallist Kemran NURILLAYEV (UZB). GANBAATAR again illustrated his country’s incredible depth in the lightweight categories as he scored a yuk before winning by ippon after just 41 seconds. Junior European champion Francisco GARRIGOS (ESP) produced a remarkable day of judo as he followed up on his continental success by winning the world title in Fort Lauderdale. GARRIGOS, who was regarded by many fans and experts as the fighter of the day, defeated the gutsy 2013 Cadet World Championships bronze medallist TSENDOCHIR Tsogtbaatar (MGL) who pushed him all the way in a glorious -60kg final. GARRIGOS sent his team wild by securing the shime-waza which forced SENDOCHIR to tap out after 90 seconds. In the first semi-final GARRIGOS defeated Junior All Japan Championships winner HAYASHI Kohei (JPN) to end Japan’s hopes of a full house on day one. The Spaniard scored a yuko with a sumi-gaeshi and that minor score proved to be the pivotal moment as HAYASHI could not break down the spirited defence of his determined foe. 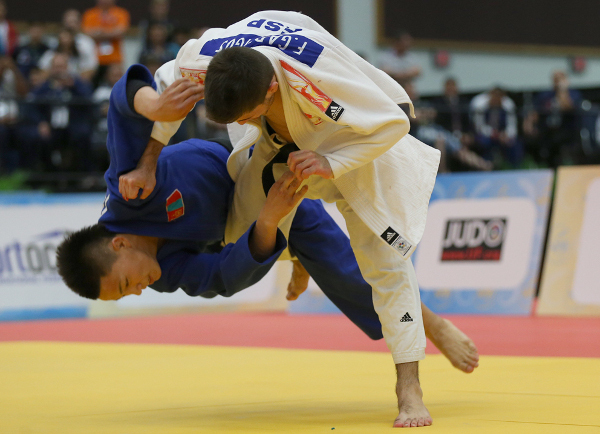 In the second semi-final TSENDOCHIR saw off Qingdao Grand Prix gold medallist CHOI In Hyuk (KOR). TSENDOCHIR prevailed by way of a single shido penalty which separated the rivals after four minutes of action at the last four stage. 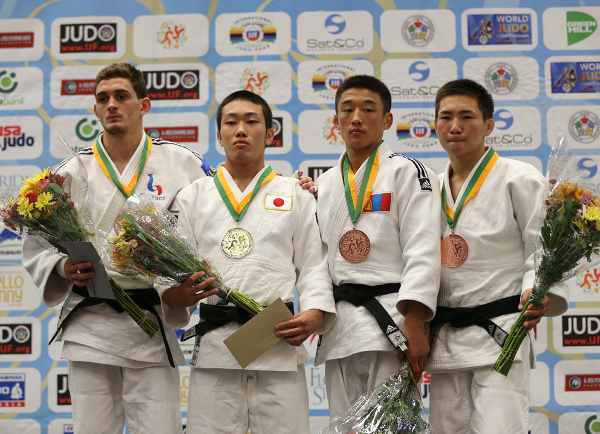 The first bronze medal was won by CHOI who beat Prague Junior European Cup winner Davud MAMMADOV (AZE) by a waza-ari while the second bronze medal went to Mehman SADIGOV (AZE) by ippon against HAYASHI as Japan missed out on a medal in the -60kg category.